What Are Interstitial Ads? Can You Use Them On Your Site? What are interstitial ads and should I use them? Interstitial ads are ads that load between pages of a user session, or even prior to reaching a search destination, that display in the middle of the screen. They are closely related to the pop-up. On desktop, these can sometimes be interesting and related to content, such as an advert for a Land Rover or Ford truck when visiting an automobile site. They have long been a tool for advertisers and publishers alike, but recent Google changes may have publishers thinking twice before leveraging them like they have in the past. It’s important for publishers to examine their interstitial strategy carefully before making any final decisions; as the new Google penalty for mobile interstitial ads has basically rendered them useless for publishers that derive any significant portion of traffic to their website from organic search. Google has been pretty sanguine about the use of interstitial advertising on desktop but recently come out pretty hard against those on mobile devices. On mobile devices, interstitial ads tend to take the form of a large format ad that blocks out all content on the mobile viewport, requiring the viewer to take an action like clicking on the ad, or closing the ad down – and it’s not always easy to find the ‘X’, ‘Close’ or ‘continue to site’ link (in many cases they can’t even be clicked due to sizing issues). Interstitials have also been used widely to drive app downloads – and it seems this is one of the major concerns Google has with mobile interstitial advertising – it takes over the content, driving people away from the site and the content the user searched for. Google doesn’t want the quality of the content on a page to be negatively impacted by the ad experience. When ads dominate a page, they see this as taking away from the value of the page. There are obviously SEO implications for this, but Google is offering even further direction to publishers on how to approach this subject. This indicates you should be paying attention now instead of later when your site might already be negatively impacted by the guidelines. 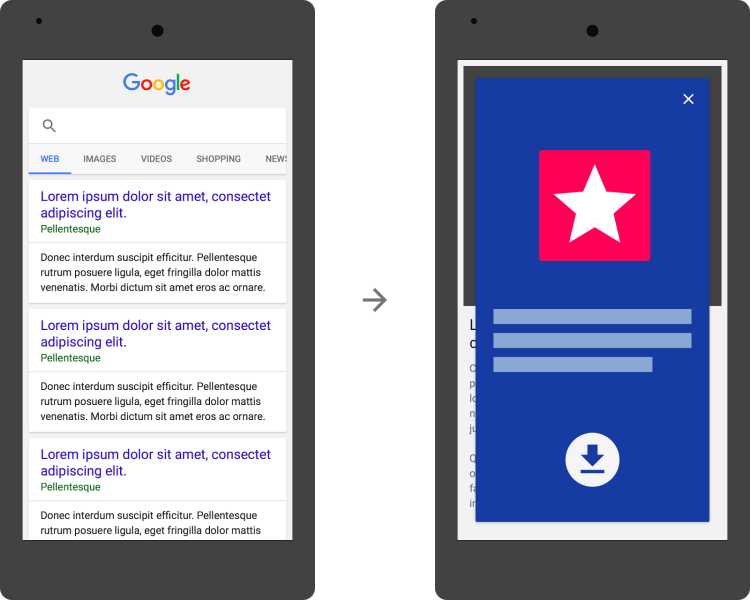 Google is currently penalizing mobile web pages that show an app install interstitial that hides a significant amount of content on the transition from the search result page. This is no longer considered mobile-friendly – so a site previously optimized for the mobile web may fall out of favor – you can check using Google’s tool. There is a debate about the value and future of apps v the mobile web – with the mobile web you are reliant on connectivity, whereas an app can be faster (depending on your phone and infrastructure) and is available offline. It’s probably worth learning more about Accelerated Mobile Pages and Progressive Web Apps if you haven’t already. Vignette ads are similar to interstitial ads in that they are full-screen ads that can be closed or skipped. The major difference is that vignette ads appear as the user is leaving the site, rather than when the user first comes to the site or is navigating to another page. Google has not given clear indication whether or not these will be penalized to the same extent as interstitial ads, but they do seem to be in opposition to some of Google’s new standards. With time we will be better able to assess a clearer picture of Google’s opinions on Vignette ads. It’s long been thought that some of these adverts are a little too annoying for site browsers. They can end up driving people away from your site. So when considering these types of ads, it’s always good to instigate a testing regime. It’s vital to have plenty of data from before serving these types of ads so you can make a valid comparison. Bounce rate is a good proxy for user experience so you might start by monitoring this metric. Interstitials might generate good revenue or help with app downloads, but it’s important to view benefits holistically. Is a few extra dollars or more app downloads worth losing visitors? Are users bouncing off, or spending less time on your site? These things could be negatively affecting your SEO in the long term. Ultimately, be aware of the changes you make to your site and the impact they have on your users – and to do that, it’s vital to create and implement a thorough, continuous testing regimen. Pay attention to what Google says, but take ultimate responsibility for the quality of experience your users have. This is the best way to approach interstitial ads. PreviousWhy Are Ad Earnings Dropping?